Happy (new) feast day to my fellow Catholics! Today, for the very first time, we get to celebrate the Memorial of the Blessed Virgin Mary, Mother of the Church. For all of the official readings and teachings concerning this new feast day, click on this link. You’ll be directed to the USCCB (United States Conference of Catholic Bishops) website and can peruse to your little heart’s content all about the theology and particulars of this feast day. As for me, though, I’ll just share one or two of my own simple thoughts. Because, as we are all aware, I am not theologian and my musings tend to be pretty basic. Way back at the very beginning of the Church, Jesus makes a point to establish a relationship between the Church and Mary. In the Gospel of John, while he is on the cross, Jesus actually gives his Mother to us. You can read the story here (John 19:25-30), if you’d like. So, we as a Church, have looked to Mary as our Mother since the very beginning! Today’s feast day is simply a new way to honor an old attachment, if you will. Now, of course, I have to add this note for any of my non-Catholic readers. We are not “worshiping” Mary. We are celebrating and honoring her in the position that Jesus gave her when He entrusted her to St. John. Maybe think of it as Mary’s Mother’s Day in the Church! Wouldn’t you know it that my favorite saint, St. Mother Theodore Guerin, would have something to say about the subject? And how Providential that this quote showed up in my day calendar just yesterday! Is it not admirable to see how the Blessed Virgin loves us? It is to her that we owe everything, for she is the channel through which come all the graces that God showers upon us so profusely. Mary loves us as a mother and provides for us through her prayer. With every Hail Mary and Memorare and Hail Holy Queen we say, we ask our Mother to pray for us to her Son and the Father. How blessed are we to have such an intercessor?! And the Church, in her goodness, has provided us a prayer for today, as well. I snagged this from the USCCB page linked above. 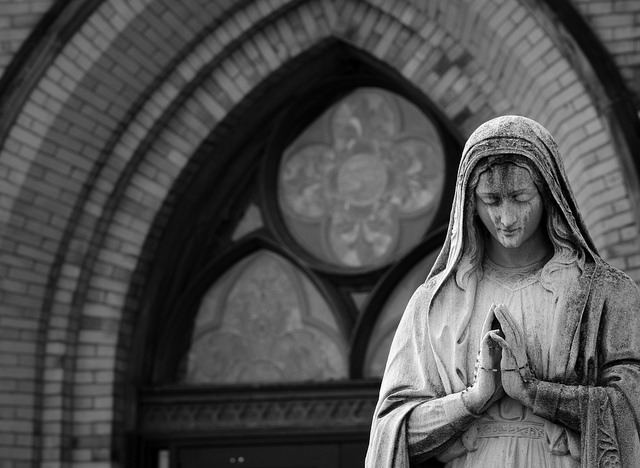 I love how the prayer asks God the Father to bring us closer to our Mother. Happy new feast day, everyone!